LG corporation gives you a chance to win an LG G3 Stylus smartphone. All you need to do is share your most creative and sweetest photo in your Instagram account, and follow @LGPhilippines. Then tag @LGPhilippines and include the hashtags #LGG3StylusPH and #LoveLifesGood. 3. In order to qualify, All entries should be PUBLIC and linked to their facebook and/or twitter accounts. Participants may send their entries on February 2-16, 2015. Entries before or after the promo date will be considered invalid. 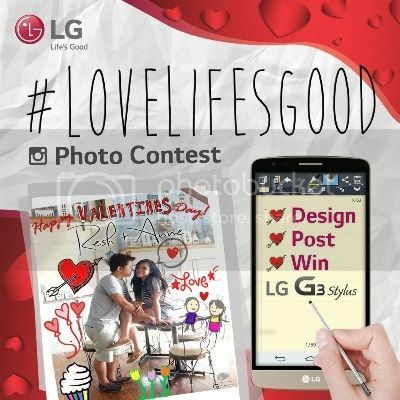 Only entries that include the hashtags #LGG3StylusPH #LoveLifesGood and tag @LGPhilippines will be considered valid. Participants may send multiple entries to increase chances of winning as long as each entry is unique to avoid spamming. The winners for the LG Instagram Contest Promo will be announced after three business days and will be shared on Facebook, Twitter and Instagram accounts of LG Philippines. The winner will receive a brand new LG G3 Stylus.